Are you aware of The new Facebook algorithm?Are you aware of The new Facebook algorithm?Vil du have hjælp til den nye Facebook’s algoritme?Are you aware of The new Facebook algorithm? Are you aware of The new Facebook algorithm? Not long ago Facebook changed their algorithm on how to prioritize posts from Facebook pages. To explain it we at ComputerArts.dk have designed an infographic for you! If you have too many fans on Facebook then this algorithm will determine if your Facebook posts are relevant or not to your fans. If the majority likes your post then it determines that it’s relevant to them. 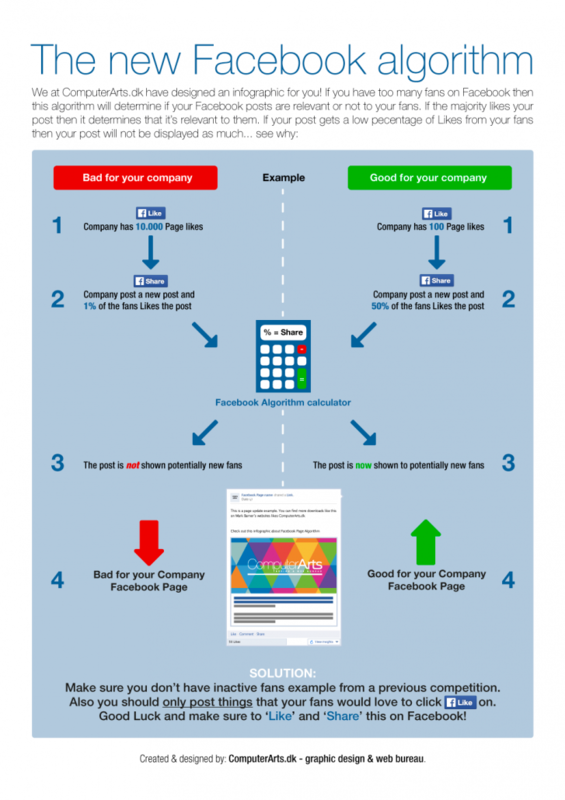 If your post gets a low pecentage of Likes from your fans then your post will not be displayed as much… check out our info graphic. http://computerarts.dk/wp-content/uploads/2013/04/ComputerArts-Logo-2013-300x91.png 0 0 Mark Barner http://computerarts.dk/wp-content/uploads/2013/04/ComputerArts-Logo-2013-300x91.png Mark Barner2014-02-11 22:39:502014-06-16 21:57:50Are you aware of The new Facebook algorithm?Are you aware of The new Facebook algorithm?Vil du have hjælp til den nye Facebook's algoritme?Are you aware of The new Facebook algorithm?